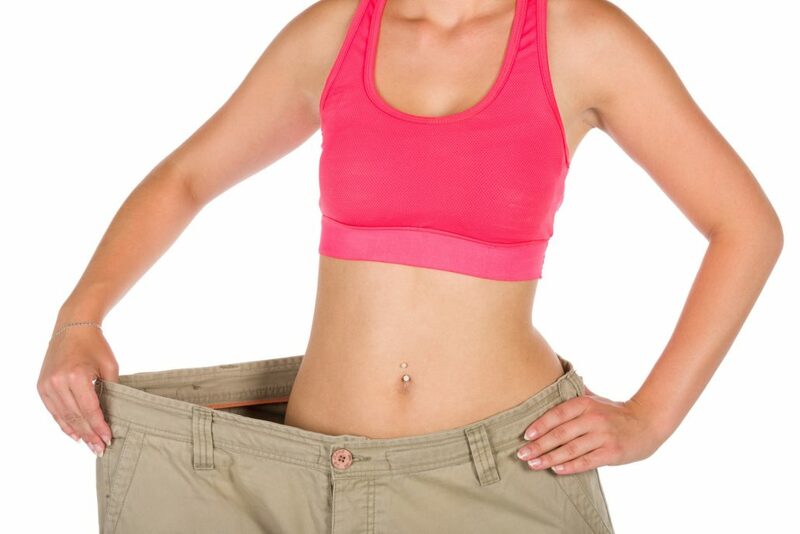 You can absolutely lose weight with yoga and there are enormous advantages to using yoga for weight loss over other artificial means and methods. In this 3 part series I am going to first discuss why yoga is good for permanent and safe weight loss, and then, in the second part of the series, I am going to give you a great set of yoga exercises for burning fat and losing weight. Below you find the Best Yoga for Weight Loss Set, complete with illustrations and practice tips. Hatha Yoga Tree Pose for Balance is the next posture of the set. 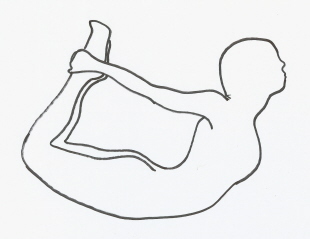 Here is a new illustration of this pose below, except I would like you to do the variation where you bring your hands above your head, as demonstrated by my son Shivum in the original article. In that variation of the pose, again bring your hands together in Namaste Pose as shown, but now raise them above your head as straight as you can. Be careful not to lose your balance with doing this posture and if you have trouble with it simply do Palm Tree Pose (Easy Yoga Pose for Stretching and Warming Up – Palm Tree Pose) instead. You can do up to 1 minute per side, taking breaks in between as required. 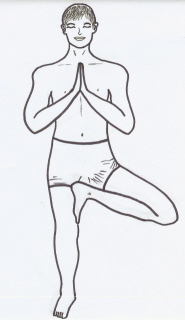 It is now time to the pose which should be an integral part of every daily yoga practice. This is important Forward Bend. You will find the details in the following article: Best Hatha Yoga Pose for Healing. We are getting to slightly tougher poses now in the weight loss set. These poses take more energy to do, but they will really help you burn fat and tone difficult regions of the body. Make sure you use the beginner modifications for them if you are not ready to do the full versions. In addition, you can start to include Breath of Fire for these exercises as well. Breath of Fire will help increase the benefits of these poses and also, increase heat in the body, open up your energy pathways and help burn up toxins and fat. The next exercise is Kundalini Yoga Bow Pose. This exercise will work on your thighs, hips and abdomens and is good for weight loss. You can do 1-2 minutes, taking breaks as required. Another excellent pose for targeting the thigh area and the abdominal region is Camel Pose. Again, remember to use Breath of Fire in order to maximize the benefits. 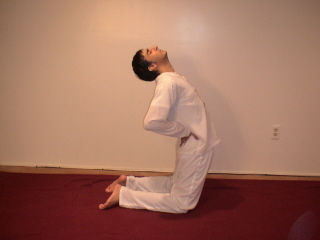 You will find details of this posture in the article, Illustrated Kundalini Yoga Camel Pose for Optimal Health. I have give both illustrations for this pose below, the modified version as well as the full version. Try to do 1-2 minutes with breaks in between. The next pose will really bring the focus to your abdominal and stomach region and will work to tone all the muscles in this problem area. It is also very good for the back and entire digestive system. Note that for this exercise you are not using Breath of Fire, but instead will inhale as you twist to the left and then exhale as you twist right. There are 2 good version of Spinal Twists, both will help you with burning calories, fat and toning the abs. Below I give illustrations of the version where the hands are behind the back. You will find the details for this exercise in the article, Lower Back Exercise – Yoga Spinal Twists. In the second version, which give you better range of motion, the hands are grasping the shoulder, with elbows up and at shoulder level. The second version is described in the following article, where there is also a video demonstration for you. It is called Yoga Twists and is exercise #4 of the great Spinal Warm Series. 1-3 minutes of this exercise with breaks as required will do you wonders. The last pose in this set is Bridge Pose. It is part of the excellent Beginner’s Morning Yoga Set (exercise #3), and also has a good variation for beginner’s who cannot come into the full posture. This pose is great for your arms, shoulders, back, thighs and hips. 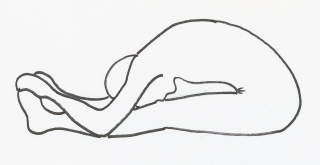 You can come into the pose and hold for as long as comfortable and then take a break when necessary. You can build up to 1-3 minutes. Here is the video which has a demonstration of this pose. LI have been stressing the importance of this pose for quite some time and it is simply doing corpse pose at the end of your yoga set. So, no matter how many of the above exercises you are doing, you should do Corpse Pose afterwords. The more exercises you do, the more time you need to spend in this pose, allowing the body to assimilate the benefits of the exercises. So if you do the entire set, you should do corpse pose for almost 10 minutes. During this time, relax completely and let the body heal, evolve and reshape itself according to your desires. Here are the details of how to practice this most important posture. Best Yoga Exercise for Relaxation and Stress Relief. This set will become part of the Free Online Yoga and Meditation Classes on the website. 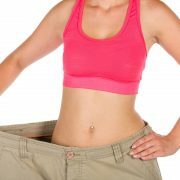 In particular it will be part of an entire second program to help you achieve your weight loss goals. Remember to follow the cautions I have laid out in the guideline articles and to check with your doctor prior to starting any new fitness regiment. In addition, remember that safe and healthy weight loss is not achieved overnight, but if you commit yourself to a regular yoga practice, you will surely love the results you get, and best of all, not lose these results easily. Hi there, my son is 5 years old and I want him to learn some yoga to increase height. I have a short height and so Im worried. Suggest some yoga asanas for 5 year kids.